It’s not uncommon to compare prices while grocery shopping before placing food into our grocery carts. Most of us let price dictate our purchasing decisions, but there’s so much more that we need to consider before checking out at the register. I’ve always known that organic is a better and healthier option, but I didn’t really understand what happens to food before I purchase it, nor the chain reaction of my decisions as a consumer. We are so far removed from the farming process–at least I was–that, as we stroll down the grocery isles, we don’t really think of all of the steps and people it took to get the food to our stores. Also, we don’t think about how our purchases are affecting our families or our planet. Recently, I had the opportunity to see the other side of choosing organic versus non-organic food and I feel as if a veil has been lifted. As a mother and wife, my family is making some changes in our household because of it. As one human to another, I am compelled to explain why we all need to start giving a sh*t about choosing organic. What the heck does organic mean, anyway? If you’re not sure what organic really means, the USDA states that organic produce must be grown without synthetic pesticides, synthetic fertilizers or genetically modified organisms. Regarding organic meat, it must come from animals that were raised in a natural setting, who didn’t receive any antibiotics or hormones, and that were fed 100% organic feed. To put it simply, organic farming is how farming used to be before the industrial revolution and the creation of synthetic chemicals. In addition, organic farming stands for pure food, pure soil, and nutrient rich crops. This means that every ingredient is certified organic, all facilities involved are certified organic, and the product may, or may not, have the USDA organic seal. This means that 95% or more of the ingredients are organic, non-GMO, and have obtained the USDA certification. The remaining 5% of ingredients must come from an approved list. All farms, facilities, and handlers must have the USDA certification. This means that 95% or more of the ingredients are certified for no artificial food additives, irradiation, GMO’s, synthetic pesticides, herbicides, or fertilizers. Animals must be fed organic feed, with no hormones or antibiotics. The remaining 5% of ingredients must come from the approved list, and all facilities must be inspected by the USDA. This means that 70% or more of the ingredients must be certified organic, and the product cannot use the USDA seal, and cannot represent that the finished product is organic. 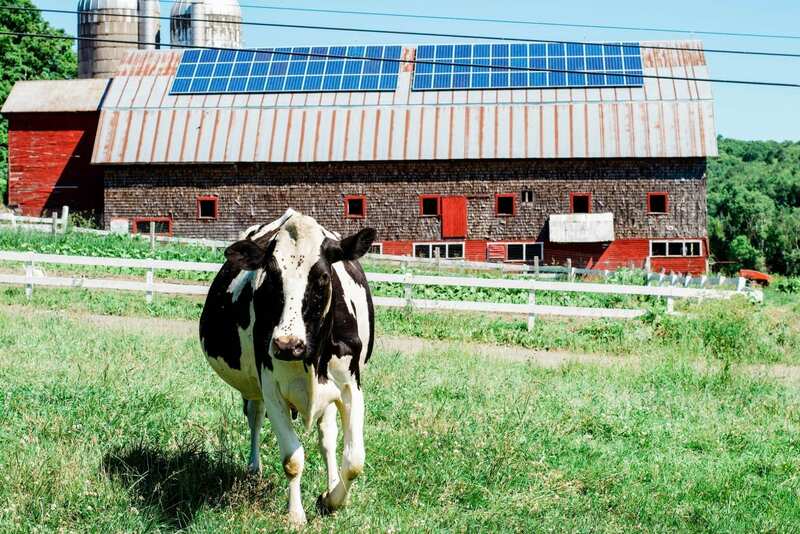 This past month, Stonyfield invited me to Vermont to visit some of their organic farms and learn what happens before their delicious yogurt is made. I was given a glimpse at what organic farming really looks like and how choosing organic positively affects, you, me, your kids, your future children, the farmers, the animals, the soil, our water, and ultimately our earth. We all care about something. Whether you are passionate about animals, living a healthy lifestyle, helping our planet have clean water, healthy soil or stopping soil erosion, creating more and better jobs in America. Also, giving your kids a healthy life, or leaving a smaller carbon footprint–buying organic can help. Here’s why we should rethink choosing non-organic food instead of organic. Do you know that non-organic food contains hormones, chemicals and pesticides? I did, but I wasn’t aware just how serious those are or how they could affect me. If you think about it, pesticides are poisonous and are created to kill. Why would we want to put poison in our mouths and in our bodies? Nothing good could come from that. Not only that, pesticides have been shown to remain in our bodies for years so it’s not a one time thing that will only affect us and our health for a short period of time. 2. Your Children’s and Future Children’s Health. This really hit home for me. I want to give my son and my future children the best start at life. This is why we are going to buy organic when we can. 3. Soil Erosion. Clean Water. Clean Soil. Healthy Planet. Everyone should care about our planet. It is our home. And unfortunately, there are non-organic farms and non-organic food operations disposing pesticides incorrectly, which are contaminating our soils, rivers, lakes and reservoirs. With all the pesticides and chemicals being used, it’s becoming a major problem and putting our planet at risk. Did you know that organic cows are happier, healthier, and require fewer vet visits than conventional cows? It’s true. Research also shows that organic livestock is more likely to be treated better than non-organic livestock. This is something that I learned during my tour. Also, it was obvious that these cows were loved by their farmers and lived very good lives. Two female baby calves were born just hours before our arrival. Pesticides and chemicals have also been linked to infertility problems in males and females. 6. Creating Good, Sustainable Jobs. Every time you make the choice to buy organic, you are supporting a smaller farm. They are able to make a profit and grow, while maintaining their organic principles and sustainable farming practices. Furthermore, organic farming helps small family farmers survive. “A farmer feeds you three times (or more) a day.” I want to support those hardworking farmers. Go family farms! Many people complain that organic food is too expensive. I was the same way. But think of it this way, you’re making an investment in your health and your family’s health. Would you rather provide quality food for a healthier life now, or potentially run into medical bills from choosing the alternative later? Buying organic can save you money in the long run! Yes, right now organic food can cost more. However, the only way to show our government and businesses that people care about quality, affordable organics is to buy quality organics. It goes back to the simple concept of supply and demand. When you make a conscious decision about the product that you’re buying, you’re “voting” with the money you spend. Money talks. When people continually purchase organic food it shows consumer support for organics and then companies will try to meet that demand with better, more competitive prices. We had a delicious meal prepared for us at one of the farms. 1. Look for the USDA Organic seal. You may think that you are choosing healthy, organic options with labels with the word “natural” or even “organic,” but if there isn’t a USDA seal, it means nothing. 2. It’s not all or nothing. Start somewhere. I wish that I could afford to purchase everything organic, but that’s not possible for our family. But buying organic food doesn’t have to be all or nothing. We need to start somewhere! Good places to start are by buying your dairy organic and by looking at the dirty dozen and the clean fifteen. Here’s Gary feeding one of the farmer’s grandchild Stonyfield yogurt. 3. Motherhood is tough. If you’re too busy or don’t want to go to the grocery store with your kids, choose Blue Apron. I get it. Going to the grocery store with your kids can be a pain. You may not want to have them around when you’re trying to take your time looking for the best options for your family. If you need a quicker and easier way to start, visit Blue Apron. Companies like Stonyfield and Blue Apron are transparent with their ingredients so you know that you are receiving high quality, fresh ingredients that are good for you and your family. I actually had the pleasure to meet some of the Blue Apron team and enjoy a seasonally inspired Blue Apron dinner experience with hors d’oeuvres, wines, and an incredible five course interactive farm-inspired dinner created by their Culinary Team at the Philo Ridge Farm. These fried risotto balls were fabulous! Our table was decorated so beautifully with fresh herbs as the centerpieces. During our dinner, the chefs spoke about the process of creating new recipes for Blue Apron as well as their sourcing philosophy. They are all about seasonality, sustainability, and providing the best quality ingredients and recipes to their customers. Blue Apron’s head chef, John Adler, with chef Tracy Malechek as they prepared the ricotta with Stonyfield yogurt for our second course. It was apparent that Blue Apron is passionate about making food fun, interactive, and delicious for families. All of the beautiful centerpieces at our table were ingredients that we could use to personally garnish each of our dishes. It was such a fun way to get us all to participate in personalizing our plates. Furthermore, cater to each of our preferences and palates. Genius idea for your next dinner party! Learning why we all need to give a sh*t about buying organic, but also a load of fun. In addition, I had the pleasure of meeting some other incredible women (along with Gary) that are also doing their part to spread the word about the importance of eating healthy and supporting organic farmers. I hope that I’ve been able to convince you to do the same. Or, at the very least, have a second thought before you add your next grocery items in your cart during your next grocery shopping trip. Left to right: Kristina (from Stonyfield), LaTonya (from LaTonya Yvette), Adrianna (from A Cozy Kitchen), Yumna (from Feel Good Foodie), Gina (from SkinnyTaste), Gary (from Stonyfield), Melissa (from The Faux Martha), Nina (from Baby Chick), Jeanine (from Love & Lemons), Mairead (from Stonyfield), Marcia (from Stonyfield).